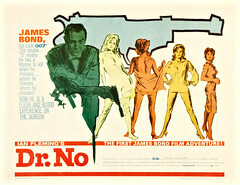 Did you know that on this day in history, October 5 of 1962, Dr. No, the first in James Bond film series, was released? In the film, James Bond is sent to Jamaica to investigate the death of a fellow British agent. The trail leads him to the underground base of Dr. Julius No, who is plotting to disrupt an early American manned space launch with a radio beam weapon (Wikipedia, 2012). On another note, here are the PCSO Lotto Results as drawn October 5, 2012.